Not to be confused with the Gulf of Boothia. "Bothnia" redirects here. For other uses, see Bothnia (disambiguation). The Gulf of Bothnia (Finnish: Pohjanlahti; Swedish: Bottniska viken, i.e. Bottenviken + Bottenhavet) is the northernmost arm of the Baltic Sea. It is situated between Finland's west coast and Sweden's east coast. In the south of the gulf lie the Åland Islands, between the Sea of Åland and the Archipelago Sea. Bothnia is a latinization. The Swedish name "Bottenviken" was originally just "Botn(en)" with botn being Old Norse for "gulf" or "bay"; which is also the meaning of the second element "vik". 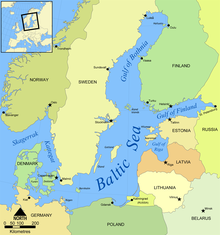 The name botn was applied to the Gulf of Bothnia as Helsingjabotn in Old Norse, after Hälsingland, which at the time referred to the coastland west of the gulf. Later, botten was applied to the regions Västerbotten on the western side and Österbotten the eastern side ("East Bottom" and "West Bottom"). The Finnish name of Österbotten, Pohjanmaa, or "Pohja"-land, gives a hint as to the meaning in both languages: the meaning of pohja includes both "bottom" and "north." Pohja (bottom) is the base word for north, pohjoinen, with an adjectival suffix added. A second possibility is that botten follows an alternative Scandinavian connotation of 'furthermost'. Thus, the Gulf of Bothnia would be the farthest extent of the Ocean. Julius Pokorny gives the extended Proto-Indo-European root as *bhudh-m(e)n with a *bhudh-no- variant, from which the Latin fundus, as in fundament, is derived. The original meaning of English north, from Proto-Indo-European *ner- "under", indicates an original sense of "lowlands" for "bottomlands". On the other hand, by "north" the classical authors usually meant "outermost", as the northern lands were outermost to them. The origin of the word is indeed very ancient, belonging to a period before the world discoveries by the Portuguese. Until then, north was not seen as the magnetic top of the world, East being the normal orientation of a map. Also, in Saami, the cardinal directions were named according to the different parts of the typical tent used by this nomadic people. The door of the tent was traditionally pointed South, in the most sunny direction, and the bottom of the tent would be aligned with the North. Thus the origin of the word 'pohja' in its use as "north". Deriving as well from this logic is the affinity in the Finnish language of the words 'eteinen', meaning "entrance room/hall" and 'etelä', "South". According to Lönnrot, north was viewed as the bottom direction because the lowest point of the sun's path is there. From Simpnäsklubb (59°54'N) in Sweden, to Flötjan, Lagskær [sic], Fæstörne [sic], Kökarsörn, and Vænö-Kalkskær [sic] to the SW point of Hangöudde (Hangö Head, 59°49'N) in Finland, thus including the Aland islands and adjacent shoals and channels in the Gulf of Bothnia. The gulf is 725 km (450 mi) long, 80–240 km (50-150 mi) wide and has an average depth of 60 m (200 ft, 33 fathoms). The maximum depth is 295 m (965 ft, 161 fathoms). The surface area is 117,000 km² (45,200 sq mi). The northernmost point is situated in Töre in the Bothnian Bay. its coordinates are 65° 54'07" N 22° 39'00 E.
The depth and surface area of the Gulf of Bothnia are constantly decreasing, as the land is rising after it had been pressed down by the continental ice during last ice age. The rise is 80 cm every hundred years. Into the gulf flow a number of rivers from both sides; consequently, a salinity gradient exists from north to south. In the south the water is the normal brackish water of the Baltic Sea, but in the north, in the Bothnian Bay, the salinity is so low, from 0.4% near Kvarken to 0.2% in the northernmost part, that many freshwater fish such as the pike, whitefish and perch thrive in it. Being nearly fresh, the gulf is frozen over five months every year. 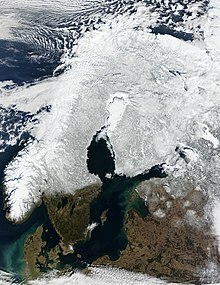 The icing of the Baltic Sea begins and ends in the northern Gulf of Bothnia. Traffic restrictions for icebreaker assistance are typically in force for all the gulf from late January to late April and for the northernmost ports from the middle of December to the middle of May. Geologically the Gulf of Bothnia is an ancient depression of tectonic origin. The depression in partly filled with sedimentary rock deposited in the Precambrian and Paleozoic. Nearby plains adjoining the gulf are part of the Sub-Cambrian peneplain. While being repeatedly covered by glaciers during the last 2.5 million years glacial erosion has had a limited effect in changing the topography. Ongoing post-glacial rebound is thought to result in splitting of the Gulf of Bothnia into a southern gulf and northern lake across the Norra Kvarken area in about 2,000 years. Some historians[who?] suggest that the adventurer Ottar was referring to the Gulf of Bothnia when he spoke of the Kven Sea in the 9th century. It is also possible that Claudius Clavus's usage of the term Mare Gotticus in the 15th century refers to the Gulf of Bothnia. The land surrounding the Gulf of Bothnia is heavily forested. Trees are logged, then transported to the coast for milling. The gulf is also important for oil transport to the coastal cities and ore transport to steel mills, for instance in Raahe. In terms of tonnage in international traffic, the largest ports on the Finnish side are Rauma, Kokkola and Tornio. The main ports of the Swedish side are in Luleå, Skellefteå, Umeå, Sundsvall, Gävle and Hargshamn. In Luleå, iron ore pellets are exported and coal is imported. Gävle is Sweden's third-largest container port. It also ships forest products and oil. In the Gulf of Bothnia, icebreakers assist the ports needed in average half a year, when the Gulf of Finland, the season is only three months. There is some fishery, mainly Baltic herring, for domestic needs. A persistent problem has been pollution, because the sea is enclosed by a large drainage basin and is poorly connected to fresher waters from the Atlantic. Mercury and PCB levels have been relatively high, although the Finnish Food Safety Authority considers the herring edible. Although the levels exceed the limits, the fatty acids have health benefits that offset this risk. ^ "suomen kielisten ilmansuuntien etymologia". Kysy.fi. 26 July 2006. Retrieved 18 November 2016. ^ "Töre båthamn". hamnar i Kalix (in Swedish). bottenviken.se. Retrieved 1 December 2015. ^ a b "About the Bay of Bothnia". Bottenvikens Skargård. Archived from the original on 5 October 2013. Retrieved 1 December 2015. ^ "Perämeren erityispiirteet". www.ymparisto.fi. Archived from the original on 21 January 2012. ^ Lidmar-Bergström, Karna (1997). "A long-term perspective on glacial erosion". Earth Surface Processes and Landforms. 22: 297–306. ^ Tikkanen, Matti; Oksanen, Juha (2002). "Late Weichselian and Holocene shore displacement history of the Baltic Sea in Finland". Fennia. 180 (1–2). Retrieved 22 December 2017. ^ "Table 4. Statistics on international shipping 2014" (PDF). Statistics from the Finnish Transport Agency. Retrieved 1 December 2015. ^ "Climate change creates new prerequisites for shipping". Climate Guide. SYKE, Aalto University, YTK & Finnish Met. Institute. Retrieved 1 December 2015. Wikimedia Commons has media related to Gulf of Bothnia.